Marlie and Me: We Are Winners! 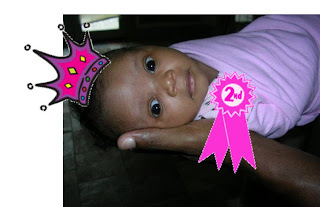 Not one to be outdone, my Marlie came in second place in the girls' race for Cutest Kid on the blog Baby Makin(g) Machine as part of Future Mama's fundraising campaign for the March of Dimes. Thanks to everyone who voted and donated! Even though she didn't win, I still had to give her a tiara and ribbon because she's the cutest of them all in my book, LOL! Click, Jump, and Go Enter! You gotta be in it to win it! Congratulations on 2nd! Wow! 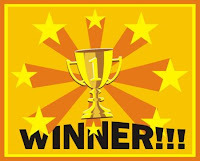 You win lots of stuff! I just won 2 things myself :o) I'm going to put all the baby stuff in a hope chest for Alyssa's baby some day. She is REALLY excited! Congrats on the wins and coming in 2nd for the photo contest! I went through a period of time where I was entering online contests left and right and actually winning. It was a lot of fun. Hope you and your beautiful family have a blessed day! Giveaways are so much fun! I spend an hour or 2 on Saturday mornings and I enter giveaways. I usually win one or 2 of them each week. I love it! My trick is to only enter the ones that are ending in a day or 2 and that don't have many comments of those who have entered. There is more chance of winning! Yay! I love giveaways too! You're on a roll! Congrats, hun!